Because this basket is filled with fresh fruit and a flowering plant, it will be thoroughly enjoyed long after the fruit is gone. 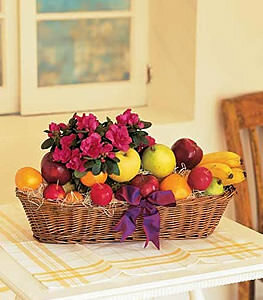 Fresh apples, bananas and pears, along with a potted blooming plant, arrive in an oval wicker basket decorated with a bow. Note: Same day delivery for this item may not be available in all areas; blooming plant may vary from item pictured.